Published by Hal Leonard Corporation. Released in 2003. Available from Steve Weiss Music. Suitable for players of all levels. 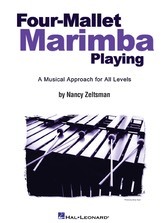 Offers guidelines for mallet selection, four-mallet grip, strokes, tone production, rolls, stickings, phrasing, building a personal repertoire, and many other topics. Includes 50 studies for developing musicianship and technique; 18 adapted solos appropriate for recitals, auditions or juries; and examples from, and commentary on, six advanced solo and chamber works.